York University Professors Andrea Davis and Honor Ford-Smith are organizing a relief drive of non-perishable items that will be shipped to the island of Dominica and other areas of the Caribbean devastated by Hurricanes Irma and Maria. They are asking the York University community to consider donating non-perishable food items, paper products and school supplies to the effort. The Hurricane Relief Donation Drive will run from Oct. 5 to 20. Donations can be dropped off at these locations: The Office of the Department of Humanities, 262 Vanier College; The Harriet Tubman Institute, 353 York Lanes, The Faculty of Environmental Studies at 137 Health, Nursing & Environmental Studies Building; The Office of Student Community & Leadership Development (SCLD), S172 Ross Building; and, The Community Safety Centre, 228 William Small Centre. Many of the tiny islands in the Caribbean have been devastated by Hurricanes Irma and Maria. The islands of Barbuda and Dominica have been virtually destroyed with infrastructure, trees, vegetation and homes completely ruined. York University community members who want to help the effort should donate the following items. The two professors will be aided by 100 student volunteers and are hoping to raise enough donations to fill the York University Shuttle Bus. Working with York University’s Transportation Services, Campus Services & Business Operations and the Office of the Vice-President Finance & Administration, they will transport the donations to students and teachers at nearby C.W. Jefferies High School. The high school students and their principal are organizing transportation of the donations to Dominica and other areas of the Caribbean that are in need. The group has developed a supporting statement for their drive. It reads: "York students, faculty and staff stand with the people of Dominica and other islands of the Caribbean as they work together to rebuild their homes and their lives. In an address to the UN, after the hurricane, Prime Minister of Dominica pointed out that small nation states like Dominica are on the front lines of climate change. 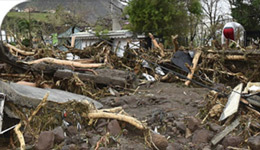 Even though they have contributed very little to the environmental changes that result in storms like Maria, they disproportionately suffer its effects. We urge members of the York community to support the people of the Caribbean in their efforts to overcome the devastation caused by these hurricanes." Davis, who is chair of the Department of Humanities in the Faculty of Liberal Arts & Professional Studies, and Ford-Smith, who is an associate professor in the Faculty of Environmental Studies, are from the island of Jamaica. They watched in horror as the two hurricanes brought havoc to Dominica, Puerto Rico, the Turks and Caicos, the Virgin Islands, Montserrat, Guadeloupe, St. Kitts & Nevis, parts of Cuba and the Dominican Republic.